The finance minister Arun Jaitley has been at the forefront in trying to defend the demonetisation or notebandi decision of the Modi government. He recently said in London: "Demonetisation was a move to change the Indian normal... a new normal had to be created. A predominantly cash economy has now to be substituted with a digital economy, which will bring more money into the banking system and lead to better revenue generation; the integration of the informal economy with the more formal one is now taking place... The post-demonetisation regime is actually going to generate a far bigger GDP in the long run." He also said that the arguments being made in favour of the cash economy were absolutely trivial. There is much that is wrong with the above statement, but in this column, I would like to just concentrate on the part that I have marked in red in the above paragraph. Before we get into anything else it is important to define the meaning of the term "informal economy". Here is a basic definition. It is that part of the economy which is not really monitored by the government and hence, it is not taxed. But there are several nuances to this as well, which we shall see during the course of this column. In Jaitley's binary world, the formal economy is good because it brings in tax to the government, and the informal economy is bad, because it does not bring in tax to the government. Demonetisation has managed to create a cash shortage which Jaitley believes will force a large section of the informal economy to move towards becoming formal and allow the government to tax them. The trouble is economics is never so straightforward. As economist Jim Walker of Asianomics wrote in a research note: "There is nothing intrinsic that says that the informal economy is a less effective or beneficial source of activity than the formal economy." Allow me to elaborate on this. Ritika Mankar Mukherjee and Sumit Shekhar of Ambit Capital wrote in a recent research note: "India's informal sector is large and labour-intensive. The informal sector accounts for ~40% of India's GDP and employs close to ~75% of the Indian labour force." The point is that the informal sector forms a significant portion of India's economy and employs three fourths of India's workforce. There are other estimates which say that the informal sector employs more than 75 per cent of India's workforce. Hence, notebandi has ended up disturbing 75 per cent or more of India's labour force. The cash crunch that has followed has severely disrupted the informal sector. As Mukherjee and Shekhar write in a recent research note: "Panipat in Haryana is the textile hub of North India. It is a ~Rs 31,000 crore industry with Rs 60,000 crore worth of goods being exported. It employs ~350,000 labourers. Whilst our interviews suggested that the export-focused units were largely unaffected, the domestic component of the industry saw business fall by 40-80% as this component of the business is more cash-reliant. As a result, almost half of the 350,000 labourers employed in the region have been temporarily laid off as demand has collapsed in the domestic market and there is no cash to pay the wages." Similarly, in Tirupur, another textile hub, "the units are running only three days a week (compared to 7 days before demonetisation) due to the lack of demand," the analysts point out. This is something that cannot and should not be taken lightly. Jaitley in his London speech said that notebandi will lead to better revenue generation for the government. This means that the government will end up collecting more taxes. The assumption here is that informal sector does not pay taxes. This is not totally correct. As I said the argument is slightly more nuanced than this. As I write in my new book India's Big Government-The Intrusive State and How It is Hurting Us: "The National Manufacturing Policy of 2011 estimated that the number of Small and Medium Enterprises (SMEs) in India stood at over 26 million (2.6 crore) units. They employed around 59 million (5.9 crore) people. This means that any SME, on an average, employed 2.27 individuals. The Boston Consulting Group estimated that 36 million (3.6 crore) SMEs (or what it calls micro-SMEs) employ over 80 million (8 crore) employees. This means that any SME, on an average, employs 2.22 individuals." What this clearly tells us is that the size of an average Indian SME is small, in fact, very small and it is a part of the informal sector. They employ around 2.2-2.3 individuals on an average. These firms basically employ the owner and one more person, on an average. Interestingly, nearly two-thirds of these firms are own-account enterprises without any hired workers. The contention is that these people who are a part of the informal economy do not pay any taxes, this includes income tax. The question is do they need to pay an income tax? Let's look at some data. Take a look at Figure 1. It shows the money being made by different categories of people. 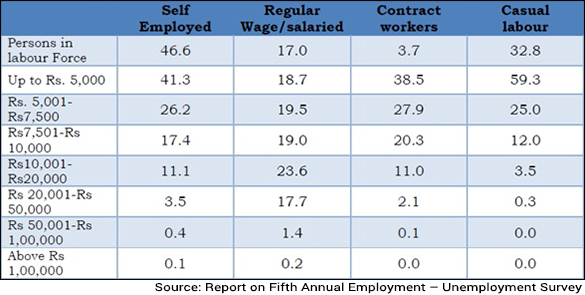 Take a look at the self-employed (remember two-thirds of small and medium enterprises in India are own-account enterprises without any hired workers). 96 per cent of self-employed earn an income of up to Rs 2,40,000 per year. Individuals come under the tax bracket only if they earn more than Rs 2,50,000 lakh per year. Almost 100 per cent of the casual labour which works in the informal sector earns an income of up to Rs 2,40,000 per year. Hence, a major part of the individuals who work in the informal sector do not need to pay income tax. Given this, even if the government was in a position to collect income tax from these individuals, it wouldn't be able to do so. The point being informal economy does not necessarily mean black economy. Also, it is worth mentioning here that when these individuals who form a bulk of the informal economy spend the money they earn, they do pay indirect taxes which are built into the products being sold. Over and above this, the money they spend is an income for companies and individuals who are a part of the formal economy and pay income tax. Long story short-the situation is not as simplistic as Jaitley wants us to believe. Having said this, it does not mean that the entire informal sector is kosher. There are individuals and enterprises who need to pay tax but they aren't. It is these individuals and enterprises that the income tax department should be going after. Also, more revenue for the government and going cashless doesn't necessarily mean a good thing. As Walker puts it: "There is every reason to worry about the fact that moves towards a cashless economy will benefit banks (transactions cost) and governments (more taxes). The apologists for demonetisation were keen on the fact that it might prove to be an easier way for government to collect revenues. Governments come and governments go and one thing is for sure, they do not all spend money wisely. Giving them more access to individuals' money is demonstrably not unequivocally a 'good thing'." Equitymaster requests your view! Post a comment on "Mr Jaitley, Informal Economy Doesn't Necessarily Mean Black Economy". Click here! 14 Responses to "Mr Jaitley, Informal Economy Doesn't Necessarily Mean Black Economy"
Congrats Vivek for the straight forward talks. 1. I don't agree with your point regarding informal sector. this sector although look small but it is a rich sector in totality. and they do not pay taxes as much they should pay. They must be brought to purview of tax. 2. your point that notebandi has disturbed 75% or more of labour force. Again i disagree. This may be temporary phase. It has settled or will settle soon. 3. Why Mr. Jaitley is not bring rich farmers in the purview of tax. In the name of agriculture, i think, some are taking undue advantage. The tax on agriculture must be based on the area of cultivating land a farmer owns. Govt. review this. 4. many of us trusted Modiji and gave up Gas subsidy. But with the recent hike in price of domestic LPG now i feel betrayed. Looking at the price of subsidised gas, i feel, I am being made to pay for the cooking at the homes of others who might have not given up subsidy. 5. i further fear that the price of unsubsidized gas will keep increasing and thus only the honest will suffer. I in agreement with your views. I am regular reader of you. This Govt. and this finance minister is doing and has done every thing to punish small people. Tax on PF was a classic example of this. They just want to show that they are doing something. Hence instead of doing really innovative and useful things they are spending their time as well as peoples time. I am worried that now the smart persons who really were not paying taxes though were suppose to, will find some other tricks like barter trade etc. Then this Govt. will have some another idea to stop this. They can easily pass coming 10 years with this. I am sure you are fully aware of with bill and without bill economy in India. We have been living with this for the last seven decades without objecting to this phenomenon since in our convolted thinking that this is great with us as individuals. But then this so called informal economy has really been a drain on the formal economy. Even if 30% of these can be brought under the income tax or the sales tax or the service tax regime we would really thrive as a nation. We feel that we can get away with this and therefore hate people who want to bring around this basic change in our thinking. We want such steps to fail so that we continue in our merry ways and say Nothing good can ever happen in this nation. Let us work towards a more transparent economy. I DO NOT AGREE WITH YOUR ONE SIDED VIEW. DEMONETISATION HAS DONE GREAT JOB TO INDIAN ECONOMY AND FOR HONEST TAX PAYERS. YES, IT HAS HARMED THOSE WHO DO NOT PAY TAXES AND CHEAT INDIA. Too much negativity; these articles engender fear-mongering. Bank NPAs or highly stressed loans are at 16.6%. This is highest in any major economy. Most of the banks, including SBI, is forecasting worsening NPAs. Bank credit growth is very weak. It seems like informal sector is struggling and major jobs loss is on block. Will government give jobs to these people? While your argument of all informal economy not being black economy is correct, why should the same not move towards being digital. You almost insist that informal economy has to be cash only. It can become a part of formal economy and remove the part which you also say may be black. suggest to switch ur profession from that of a journalist to policy maker.